Alexis Sanchez may have suffered knee ligament damage in Manchester United's thrilling 3-2 Premier League win at home to Southampton, says Ole Gunnar Solskjaer. 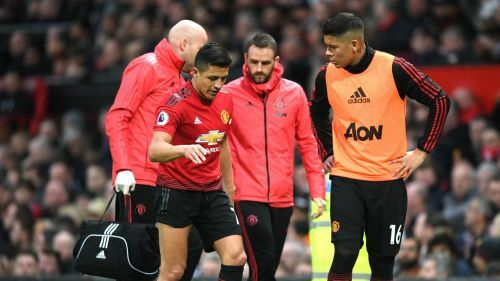 Sanchez started Saturday's game at Old Trafford but had to be substituted early in the second half after appearing to hurt his right knee following a challenge with Saints defender Jan Bednarek. With Anthony Martial, Jesse Lingard, Juan Mata, Ander Herrera and Nemanja Matic all sidelined for United, Solskjaer can ill afford another injury blow. But ahead of a tough run of games that could be crucial for Solskjaer's hopes of earning the United job on a permanent basis, Chile international Sanchez may be facing another layoff. "We don't know, we will do a scan tomorrow," Solskjaer said of Sanchez at a post-match news conference. "It might be the ligaments. Hopefully it will not be too bad." United head to Paris Saint-Germain for the second leg of their Champions League last-16 tie on Wednesday, hoping to overturn a 2-0 deficit. They will then go to Arsenal in the Premier League next Sunday, before a March 16 trip to Wolves in the FA Cup quarter-finals. Sanchez has started just eight Premier League games this term, scoring his only goal in United's 3-2 October home win against Newcastle United.